By Melissa Lennig on January 26, 2013 16 Comments. This content contains affiliate links. As an Amazon Associate I earn from qualifying purchases. It has been a frigidly cold week. And though my boys and I do enjoy playing outside in winter, we don’t appreciate the kind of cold that instantly bites skin and freezes our breath. Needless to say, we’ve spent more time indoors watching movies, visiting the library, and making crafts the past few days. Since it has been so very cold, an arts and crafts project that used ice as the main material seemed very appropriate. 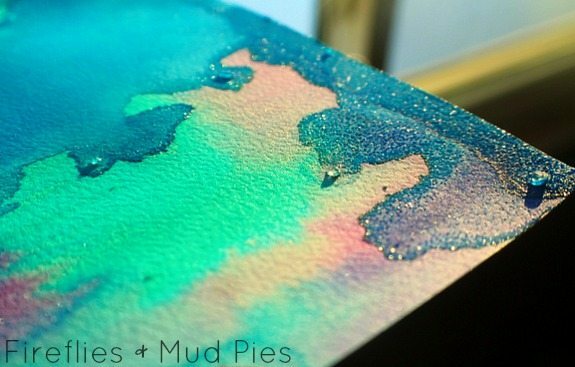 Painting with ice is a creative way to incorporate science and art, with a beautiful end result! Note: For your convenience, this post contains affiliate links. 1. 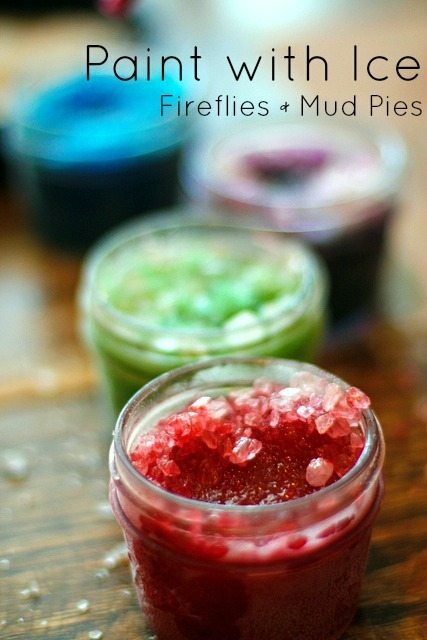 Squeeze several drops of food coloring or liquid watercolors into small containers. I used wide mouth 4 oz. canning jars. 2. Fill the remainder of the jars with water. Freeze the jars outside (or in the freezer) overnight. 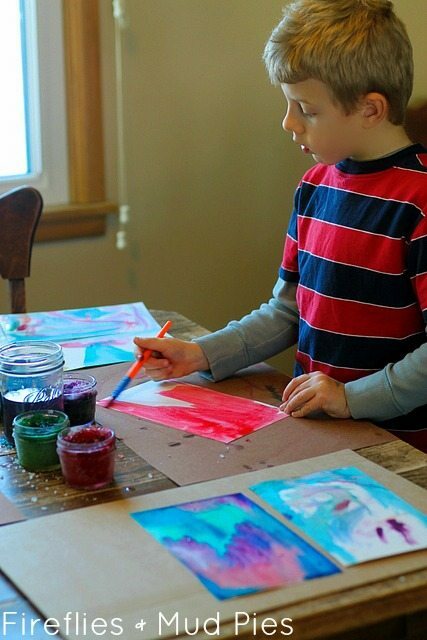 In an effort to give the boys an opportunity to problem solve, I simply presented them with the frozen paint, several brushes, and a pad of watercolor paper. “Ummm, Mommy?” my oldest said. I gave the boys a pan filled with rock salt and invited them to sprinkle it over the frozen paint. Almost immediately, the paint began to melt. Soon enough, my young Monets were ready to begin their masterpieces! When the paintings were dry, most of them contained very fine salt crystals inside the cavities of the watercolor paper. The paintings were beautiful and sparkly! 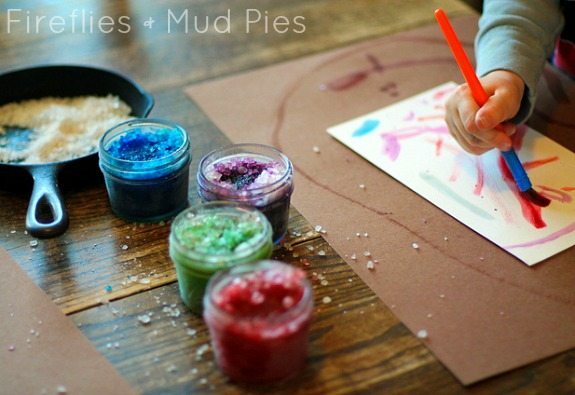 For more fun arts and crafts activities, consider following my Arts and Crafts for Kids board on Pinterest. Happy painting! What a great idea! I can’t wait to try this with my girls!